The brand new all-electric Ford Focus is displayed at the 2011 International Consumer Electronics Show at the Las Vegas Hilton in Las Vegas, Nevada. Automakers are taking a drive into the future at the Consumer Electronics Show. The annual event is traditionally a showplace for mobile phones, computers and television sets but car makers are grabbing a lot of attention this year with the latest in automotive technology and a glimpse at what's to come. US automaker Ford even chose Las Vegas over next week's Detroit Auto Show to reveal its first all-electric car, the Focus Electric, which can get up to 100 miles (160 kilometers) on a single battery charge and goes on sale this year. Audi attracted crowds to its CES stand with a demonstration of a "head-up display" that resembles a videogame, projecting important information like a car's speed or directions in hologram fashion on the windshield directly in front of the driver. "It shows you where to turn, the speed limit and your speed so you don't have to look down at the dashboard," said Jessica Silvia, a spokeswoman for the German automaker, which has also been experimenting with self-driving cars. Audi's self-driving cars were not seen zipping around CES but a concept car developed by General Motors was -- the two-wheel EN-V, or Electric Networked Vehicle, which can park itself or be summoned using a smartphone. Test rides in the two-seater bubble-like EN-V, which was making its debut in the United States after first being shown at the 2010 World Expo in Shanghai, were a popular diversion among CES attendees. 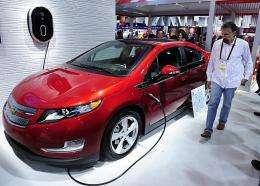 An attendee looks GE's new Residential WattStation plugged into a Chevrolet Volt electric car at the 2011 International Consumer Electronics Show on January 8, in Las Vegas. The annual event is traditionally a showplace for mobile phones, computers and television sets but car makers are grabbing a lot of attention this year with the latest in automotive technology and a glimpse at what's to come. 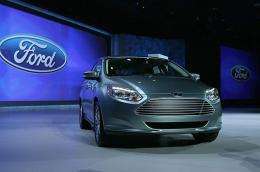 Ford showed off the 2012 Ford Focus version of MyFord Touch, a touchscreen navigational and entertainment display mounted on the dashboard that besides being touch-responsive can also understand 10,000 voice commands. "I can get destinations, I can get songs. I just have to tell it what I want," said Paul Aldighieri, a Ford spokesman. "We don't want you to control the content with your hands we want you to tell the car what you want." The information on the screen is color-coded -- blue for climate, red for entertainment, green for navigation and yellow for phone -- to minimize the amount of time a driver takes their eyes off the road. Ford also introduced a new software program called Sync Applink which can access mobile applications like Pandora Internet radio after being connected to an Apple iPhone, a Blackberry or an Android-powered smartphone. Aldighieri said Ford was working on putting a full Web browser in the car. 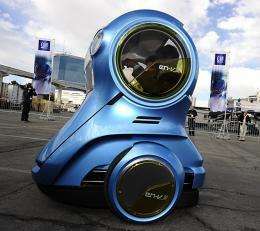 An EN-V Xiao (Smile), an urban mobility concept from GM, on a demonstration drive at the 2011 International Consumer Electronics Show in Las Vegas, Nevada on January 7. The annual event is traditionally a showplace for mobile phones, computers and television sets but car makers are grabbing a lot of attention this year with the latest in automotive technology and a glimpse at what's to come. "It's part of the future," the Ford spokesman said, although he quickly added that it "would be locked out while you're driving." QNX Software Systems, a subsidiary of Blackberry maker Research In Motion, gave a demonstration of a dashboard-mounted display a spokesman described as a "mobile office." Once a Blackberry is synched to the car using Bluetooth "you can see your contacts, your email messages, your text messages," said Sheridan Ethier. "It'll read your emails back to you while you're driving," Ethier said. "It's a nice way to drive your vehicle and stay connected to the office." Audi chairman Rupert Stadler said staying connected -- even when behind the wheel -- is the future. "In every other aspect of our lives, the Internet and all it has to offer has become increasingly mobile," Stadler said in a CES keynote speech. "We're making the Internet mobile in an automobile," he said, with interfaces designed to minimize driver distraction.